We’ve come up with a team name for however long we stick together. On the first day, when Strider saw us at the border, he said he certainly didn’t expect to see 4 women standing there. We joked that it was a mirage and we’ve gotten similar reactions from the border patrol so Team Mirage was born! The CDT we’ve all heard of started today. The first half of the day we hiked 12 miles cross country. That means there was no trail. It was a unique experience. In this case, there are cairns that consist of a pile of rocks holding up a wooden stick. 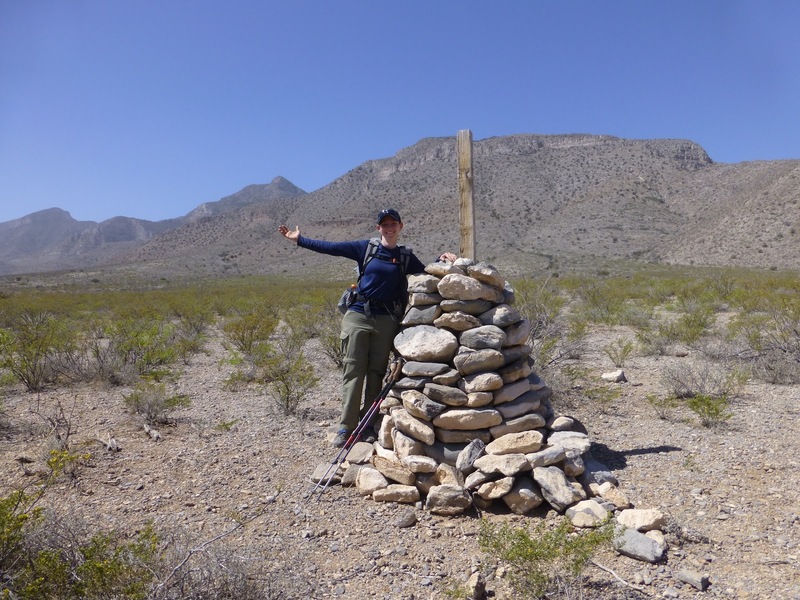 These cairns are placed sporadically over the majority of the 12mi and our job is to scan the horizon in hopes of spotting one and then walk that direction. Seems easy enough, right? Well, there are few sharp obstacles in the way we must weave between and the cairns blend in very easily to the landscape. They also look a lot like tall yucca plants. I tried to take pictures to convey it, but the video I took is the best explanation to really see it. I’ll have that video up in a week or so when I post all the videos from this section. Here are a few. 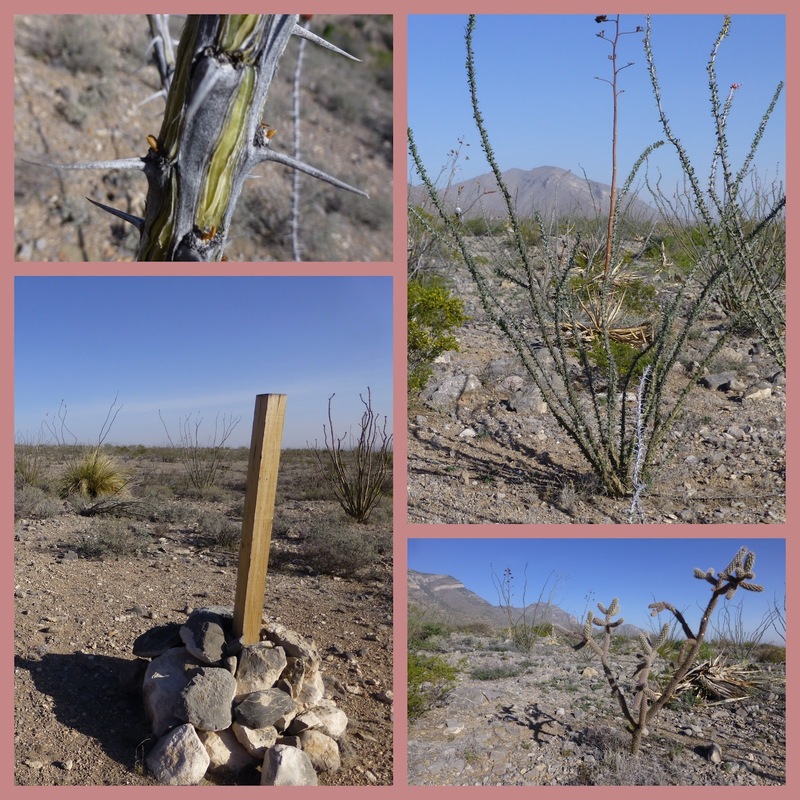 The tall plant that branches off is called ocotillo and it has some big thorns. 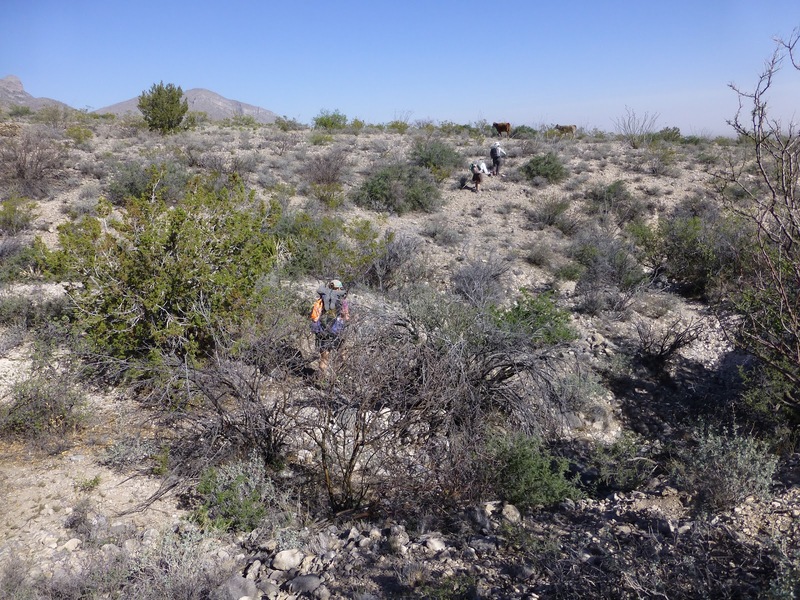 There were also plenty of cacti, yucca, sage, and other desert plants for us to weave around. Here is the tallest one for the day. We walked parallel to the Little Hachet Mtns most of the day and you can see them behind me. To add to the fun for my weak ankles the ground was very rocky and loose. To top it all off, as we wove through the obstacles, we would drop into steep little wash areas formed by water drainage just to climb right back out. Here is a picture of one of the washes. Notice the loose rocky terrain that was a land mine for my weak ankles. Other than my ankles (one is swollen as I had rolled it a month ago and it is still healing), I actually found this to be very entertaining and we had fun with it. I’m not a big fan of desert hiking and it was nice to have something to keep my mind occupied. It required constant focus to spot the cairns and then keep an eye on it while also maneuvering around all the obstacles. We got to cache just in time for lunch. 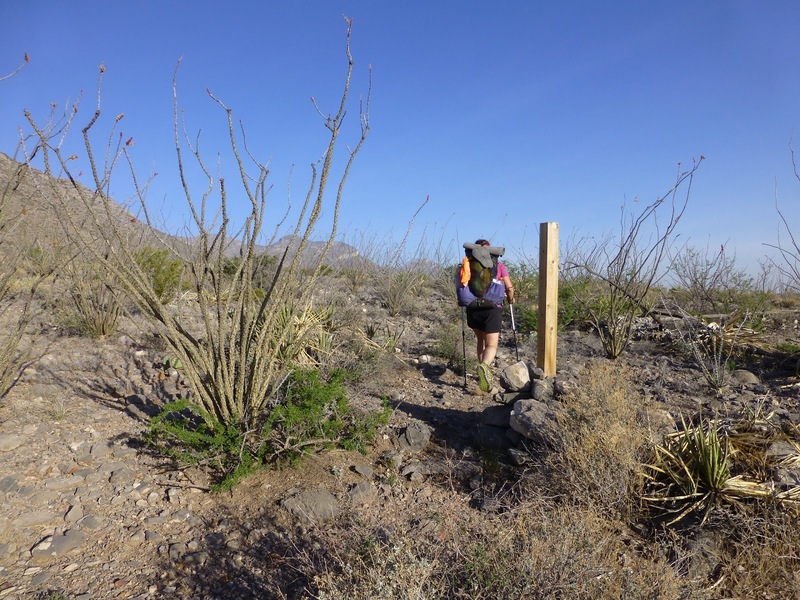 Many hikers have a desert strategy of waking early to hike before the heat, then taking a long shaded break in the afternoon during the height of heat of the day. I’m not a fan of that strategy and unless it is close to 100 degrees, I’d rather keep walking. 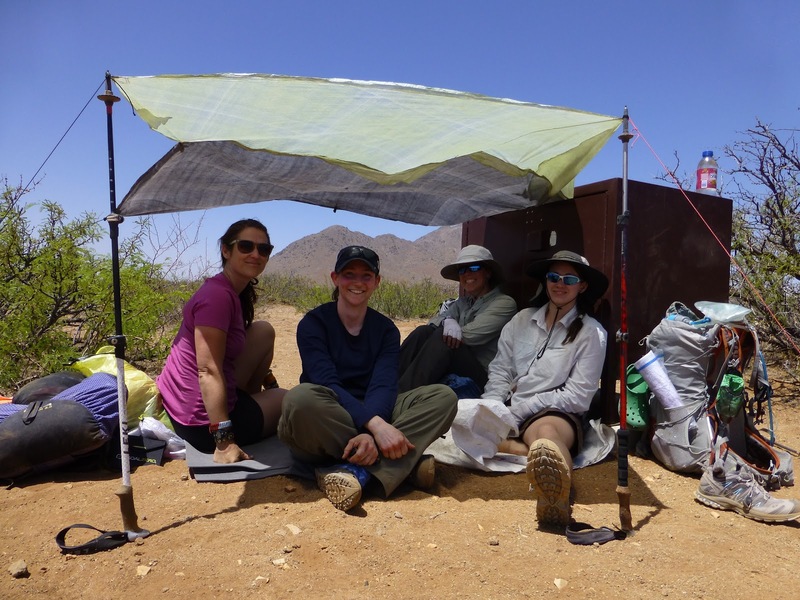 However, I was impressed with the shaded tarp the girls got up using Drop-N-Rolls ground cloth, some extra cord, hiking poles, and stakes. They even used the water cache to hold the tarp in. We sat under there for two and a half hours hiding from the sun. I’m just not a big fan of this desert strategy for me. The extended break still has me lying in heat so it wears me out. Plus, it’s really difficult for me to stop my momentum and get back up after such a long break. The other problem is that we used this strategy today without getting up extra early (started hiking at 7am), so it just made for a shorter day. It was in the 70s in the morning and upper 80s to mid 90s during the break. It was definitely difficult for me to take the break, but I am outnumbered on this one and trying to accept it. The girls know I’d rather keep hiking and just get to camp earlier or take mini breaks. They have agreed to try to leave earlier at 6:30am tomorrow. I usually do 6am, so this is a good compromise. I know this is temporary for the desert, so I’m trying to just accept it. Plus, our bodies need the shorter days to adjust to hiking again and prevent injury. We all already have some soreness and/or blisters, which will be pretty common the first couple of weeks as our bodies get back into thru hiking. Personally, my ankles hurt from rolling on this terrain, but that will pass. Also, I got my first blister on a toe today. Finally, my heat rash that I get on my feet in the desert didn’t take long to start up. So far it isn’t bad, so maybe I’ll get lucky. 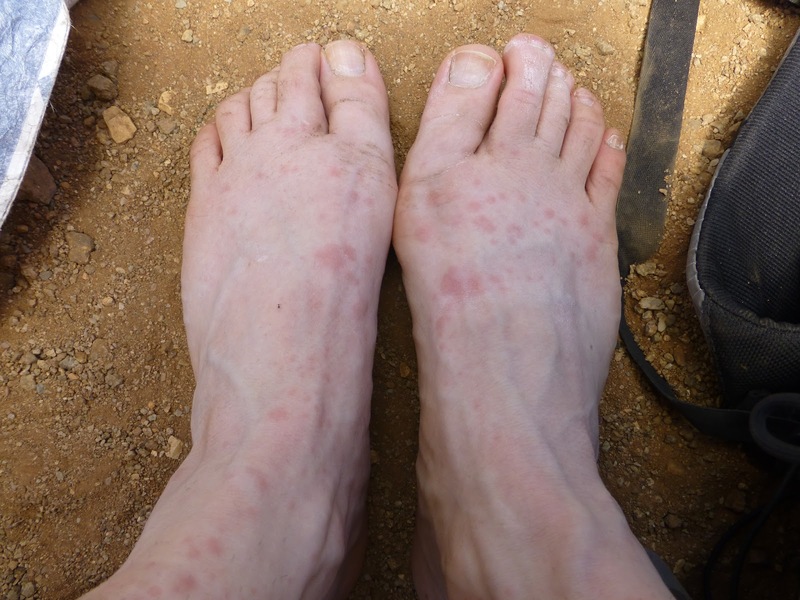 Here is a fun foot shot of my wonderful heat rash. The second half of the day was a unique reddish sandy area that was pretty draining and we finished the day with a road walk. We have a pretty nice campsite today and it’s a beautiful full moon. Strider is with us at camp again. One note from yesterday. I didn’t mention that it was Liz’s birthday. She also started the PCT on her birthday, so it’s a lucky start date. 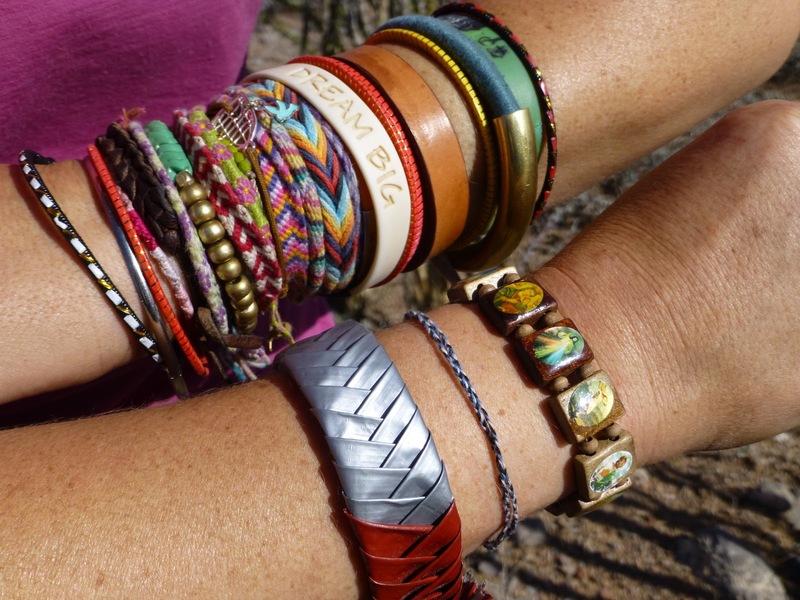 Liz asked her friends/family to make her bracelets she could wear on the hike. They are all unique and cool. Here is a picture.